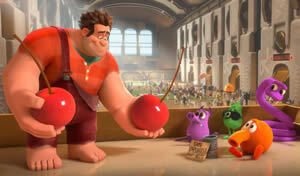 Wreck-It Ralph earns a high score for giving video games the Roger Rabbit treatment. Disney gets an early power-up on the holiday season with this disarmingly smart and witty popcorn flick; Wreck-It Ralph is exactly the kind of hip and inventive movie Pixar used to make before running low on gas with Cars 2 and wimping out with Brave. It’s alright, Pixar; John Lasseter serves as Ralph’s executive producer. Who Framed Roger Rabbit, released 24 years ago by Disney’s Touchstone shingle, featured a world in which new cartoon characters got the starring roles while loads of already famous animated characters, Yosemite Sam and Betty Boop among them, from a number of animation studios were given cameo roles. It was a hoot to see those classic cartoon characters come together. The same can be said of Wreck-It Ralph. Swap out cartoon characters for video game stars and the vibe is very much the same. “Real” video game stars such as Sonic and Pac-Man make cameo appearances in support of the movie’s stars, Fix-It Felix and Wreck-It Ralph. They’re legendary characters in this movie’s gaming universe, and their game is celebrating its 30th anniversary. There are quite a few familiar faces filling the frames of Wreck-It Ralph, including characters from Street Fighter, Dig Dug, Tapper, and Metal Gear Solid, but the guy getting the most cameo time is a former gaming superstar who’s hit hard times, none other than the jibberish-speaking Q*bert. As far as cameos go, it doesn’t get much better than that. So here’s the story: Wreck-It Ralph (John C. Reilly, Chicago), a lumbering gargantuan who’s 9-feet tall and pushing well past 600 pounds while carrying a profile eerily similar to Donkey Kong, is sick of being the bad guy. He goes around destroying buildings while the hero, Fix-It Felix (Jack McBrayer, TV’s 30 Rock), ascends buildings and rights all of Ralph’s wrongs. It’s not enough that Ralph is demonized during game play. It continues long after the game’s over and the arcade’s closed. Poor Ralph doesn’t even get invited to the 30th anniversary party being held in Felix’s posh penthouse apartment. Ralph is driven to do the unthinkable: He goes turbo. In gaming parlance, that means he jumps over to a totally unrelated video game. Ralph’s hope is to earn a medal so he can return to Fix-It Felix territory and be welcomed back as a hero. Alas, such a move is mighty darn dangerous. If you die while playing in someone else’s game it’s “game over” permanently. No re-ups, no extra lives. It’s finitoville. This is where Wreck-It Ralph manages to add in some video game environmental rules that ascend to a level of effectiveness that both Tron movies failed to achieve. Within this visually lush and multi-dimensional environment is a whole world of video gaming concepts (including the shoot-em-up heads-up display) fancifully brought to life in a 3D presentation that – believe it or not – is actually worth seeing in 3D. It’s not enough for Wreck-It Ralph to merely mine the video game landscape. Thanks to a sugar-shock inducing Candy Land-type of racing confection called Sugar Rush, a whole bonus level of material is plumbed. That would be confectionery itself; the door to left field is burst wide open and in come the Oreo guards; the explosive combo of Mentos mints and soda; and a police duo named Dunkin and Winchell. Ooops. Make that Duncan and Wynchel. These cops don’t eat donuts, they are donuts. The non-stop eye candy will no doubt please the wee youngest as well as older crowds; there’s also plenty of dialogue that will sound funny to children and will be appreciated as sharp, snappy repartee by adults. Characters rattle off lines like “Milk my duds” and make reference to “Children of the Candy Corn” and a “candy-coated Heart of Darkness.” Between the visuals and the one-liners, there’s plenty of replay value in this movie. And then there’s that whole Hero’s Duty scenario. That’s where Ralph seeks out his medal; it’s a totally different world from the kid-friendly confines of Fix-It Felix. This is more along the lines of a “Rated M” sci-fi first-person-shooter in which aliens threaten to take over the entire universe and then some. The forces of freedom are led by a tough-talkin’ military chick named Sergeant Calhoun (Jane Lynch, Glee). On the one hand, Sergeant Calhoun has endured “the most tragic back story ever,” her husband-to-be was killed at the altar during a vicious alien attack. On the other hand, wee little Vanellope (Sarah Silverman, The School of Rock), an uber-precocious sprite derided by her peers as nothing more than a gaming glitch, mocks the ultra-violent world of Hero’s Duty by riffing on the whole “doody” play on words. Yeah, it’s toilet humor. But at least it’s done in a relatively cute and funny way rather than being pure potty mouth.